In 1947, the SPG development program was approved by the British government. Several variants based on the Centurion were proposed. One of them featured a 140-mm howitzer. Two prototypes were built in 1957. In 1960, development of the SPG was discontinued. The vehicle never saw service. 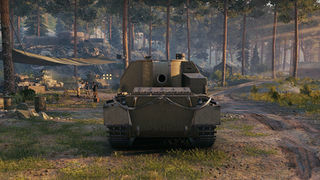 The FV3805 is the tier 9 artillery piece in the British line. It is often overshadowed by the Conqueror Gun Carriage, but it is also a capable artillery piece. It has two guns, which allows for two different playstyle setups. 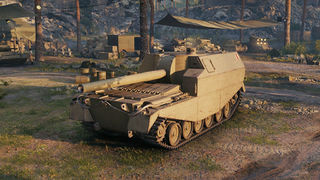 One can mount the upgraded gun for high damage and splash per shot, or one can opt for the FV207's gun with it's high rate of fire and good accuracy. It is far more mobile than the 212a and the G.W. Tiger, but less mobile than the Bat Chatillion 155 55 and M53/55. Most people consider the M53/55 to the superior artillery piece, thus the FV3805 does not see much Clan Wars use. The Q.F. 6-in. Gun Mk. V, Rolls-Royce Meteor Mk. 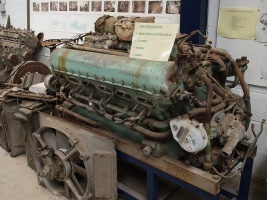 IVC Engine, and SR C42 Radio carry over from the FV207. Mount them immediately. First research the FV3806 Suspension. Finally research the B.L. 7.2-in. Howitzer Mk. 6. 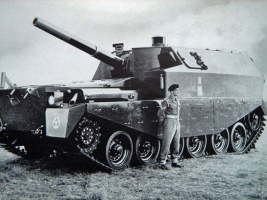 Shortly after the Brits created the FV Centurion, the engineers did what all great engineers so, they worked out how to stick bigger and more powerful guns onto this time proven chassis. 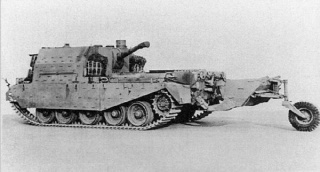 The FV 3805 was developed to complete the idea of the Universal tanks that Britain had been seeking for some time, in this case; the medium gun self propelled version. It was a Centurion tank with a casemate replacing the turret, reversed transmission and what looks like a short barrel version of the BL 5.5" Mk 3 medium gun firing over the engine deck. The Israelis also have an SPG based on the Centurion with NATO name M-72 wielding a M-71 155mm ordnance in a new turret on a new upper hull. It had a hatch in the front glacis beside the driver's position for easier access and escape. Only the FV3802 and FV3805's were prototyped. 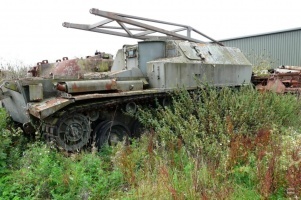 And none were put into production and I don’t know why, maybe the Abbot design was deemed better, or maybe the War office, now known as the MOD decided that heavy SPG’s were a soviet thing and by Jove they were not going to go down that route. It would appear from further rooting around in my library that it was more an issue of standardisation within NATO, and the upcoming joint European SPG project that was never completed but ran behind the scenes to produce the AS90 while the Abbot served as out primary Arty. 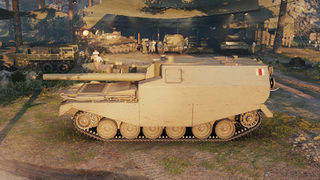 The FV3805 prototype was completed in 1957 and had hydraulic brakes and steering. Along with the features mentioned above the driver was positioned above the level of the engine bay roof to the left of the ordnance and the vehicle's forward direction was to the rear of a Centurion tank, for those of you who have read my previous posts, this is not an uncommon trait, the Archer tank destroyer had a similar method of driving and shooting, so this Arty piece wont come as a shock to some players. The barrel of the main gun was much shorter than the BL 5.5” Mk 3 medium gun and was considered a howitzer designed for shorter high angled shots, while its bigger cousin with the 5.5 could counter Soviet heavy guns. Crew was only four with driver, commander, gunner and single loader, who manually loaded the large shells; at this time I have no info on the rate of fire. From the images of the FV3802 it would appear to have a semi turret within the casemate and not a ball and socket type joint, from guesswork until I can have a root in the deeper archives I would estimate it has a traverse of about 140 degrees with 70 to either side and an elevation of about 45-50 degrees the FV3805 seems to very similar but with a (and again guess work) longer recoil I would think its elevation is more limited to 40-45 degrees. From the Photos and comparing it to known parts of the Centurion hull, the front of the casemate appears to me 7cm dovetail and welded plate, so 70mm of frontal turret armor and 180 effective on the hull. frontal shots can be harder for scouts than expected, obvious weak spots: (which are a novelty for Arty, who generally consist of any bit on the screen as a weak spot) are the large loaders hatch on the casemate side, and the spotting and viewing “bucket” on the casemate top. There would also appear to be a large loading bay or door on the back of the casemate. The commander appears to be in the top left of the FV3802. The FV3805 mounted the 5.5 inch 140mm gun was based on the BL 5.5 Inch medium gun introduced in 1941 to North Africa as a towed piece. It fired to separate rounds the heavy and light the heavy shell weighed 100 lb shell and with 4 charges in two cartridges gave it a MV of 1675 feet per second and a range of about 16km. In 1944 an 82 lb shell was introduced with the Super charge round giving a maximum range table MV of 1950 feet per second of 18Km The lighter shell contained 1.5 lbs more HE and gradually replaced the heavier shell, for gaming purposes I would say the heavier shell is used for AP, and use the KE from its weight of impact? In addition to HE there were several chemical (90 – 98 lbs) and colored smoke shells (100 lb only), colored flare was developed, which would be good for those night battles I’ve been after. The 5.5-inch Gun was one of the two British medium guns of World War 2, which both used the same carriage (the other was the 4.5-inch Gun). It first entered service in 1942 replacing 6-inch Howitzers in medium regiments. It had limited service in Indian regiments and equipped a South African and three Canadian regiments in Europe. It was popular and recognized as an effective gun, however, there was a problem with bore premature, particularly in Burma and in late 1944 some 5.5-inch were temporarily replaced by old 6-inch howitzers in that theatre. Initially it had a 100 lb shell but later in the war an 80 lb shell was introduced and this eventually replaced the 100 lb. It left British service in the mid-1970s, UK last used them operationally in Borneo and Radfan in the mid-1960s and the last round was fired in UK was in 1995. Its last operational use seems to have been with the South African Defence Force in Angola in the 1980s. In European countries it was referred to as the 140-mm (or 14-cm) gun. No SP versions ever entered service although an SP was the highest priority equipment at the end on WW2. 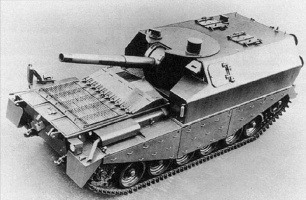 After WW2 there was an open SP built on the Crusader gun tractor, some design work on FV 305, a 5.5-inch SP using the proposed FV 300 series carriage, it was cancelled in 1948. However, in 1950 a new SP design started, FV 3805, based on a Centurion tank chassis. A prototype was built, it had a fully enclosed fighting compartment and a barbette mounted gun. It was cancelled in about 1958. This page was last modified on 31 August 2017, at 23:50.